Until 2 days ago, Las Vegas had always been a remote curiosity to me. I’ve seen the tourism ads on TV that tend to be a little racy and generally inappropriate. “What happens in Las Vegas stays in Las Vegas” has become a boring, overused meme where “Las Vegas” is swapped out with anything apropos (especially if it isn’t). The “Sin City” moniker implies Las Vegas to be a place of wanton hedonism, where one can act out their naughtier urges without inhibition. And then there’s the shows. And the buffets. And the gambling. On it goes. In short, Las Vegas is not my kind of place. When I need some downtime, I like to drive in my car…by myself. I like to hike in the woods…by myself. And just in general, I like quiet. Serenity. Springtime in my New Hampshire home office is glorious, as I can sit with the windows open and listen the songbirds accompany a Beethoven piano sonata while I do network design, research and write. That’s living. 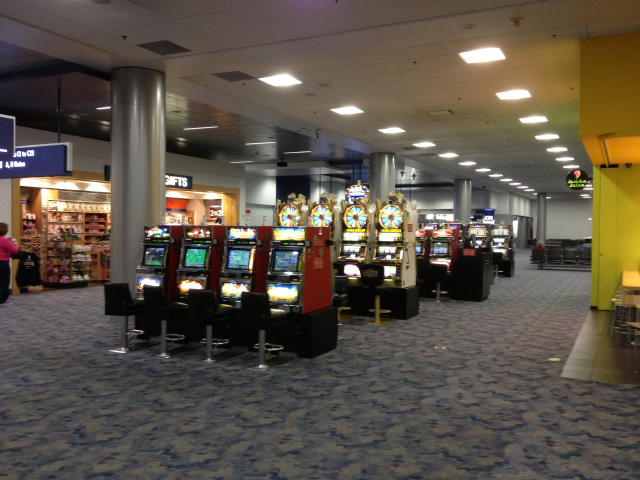 With trepidation then did I step off of a plane and into the Las Vegas airport. It was as if a purpose-built assault team had assembled to create a place that would make an introvert wilt on contact. An army of slot machines, bright lights, and advertising placards greeted me, with half the place covered by screens, lights, or signs. And there’s noise. Noise, noise, noise. Such an unholy racket of machines clanking and computers blarting and recorded voices inviting you to do this or that. Las Vegas airport welcomes you with a slap in the face. BOOM! This is three steps inside the airport, mind you. It gets worse. After weeding through the sea of signage to find the ones that told me how to get out of the airport, a cab ferried me to “the Strip.” The quick drive from the airport to the strip was yet another assault on the senses. The cab itself had a screen inside spewing forth a virulent diarrhea of advertisements. The approach to the strip was exposure to some of the largest ads in the world, where lighted billboards taking up the entire sides of buildings would beckon viewers to come see a show. After roughly ten minutes of travel, I was dumped at a resort/hotel/casino property, and walked inside. Mandalay Bay is a mall, casino, hotel, and collection of restaurants all in one massive complex of stone, glass and electricity. And where the Interop convention I was attending was held. Because, oh yes, Mandalay Bay is also a full conference venue that could house the reported 13,000 attendees, no problem. This was not a merely complex of buildings – I never went outside once I went in – as much as a city all its own, with every service & luxury you can imagine available to those who can pay. This shot below is from an area near the MB lobby. Not whatever the official casino area might have been. Not deep within the bowels of the massive complex. Just inside the door. This was taken very early in the morning as I was on my way out to the airport, thus the dearth of people. But still. Just look at it. All the lights and sounds. And that carpet! Ugh. Everything is just so busy and over the top. 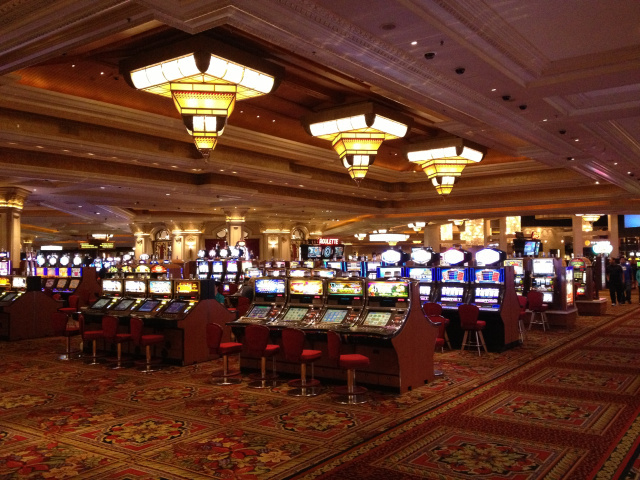 Mandalay Bay will kindly thank you to leave all of your money in these convenient collection devices. Las Vegas is everything I’m not into. (I might have to make an exception for the reported buffets, which alas I was not able to explore during my brief trip.) I wouldn’t go out of my way to go there again, certainly not for vacation. An Alaskan cruise? We’ve discussed perhaps visiting Alaska at some point, and a cruise seems like an interesting way to do it. Or is a cruise ship just Las Vegas in the water? An all-inclusive resort in the Caribbean? This is another idea we’ve had. Or are these places just Las Vegas on the beach? I have no particular experience with cruises, so I can’t comment on that except to say that I’ve been to Alaska many times and can’t see where being on a boat would make it any better or different. As for the all-inclusive resorts, I do have experience here and what I’ll say is this: everything depends, as it always does, on how much you spend. My wife and I got married on a beach in Cozumel, Mexico at an all-inclusive resort and it was absolutely magical. That said, we paid a bit more than the average person might and we also went during the off-season (read: high hurricane probability, though we dodged this bullet). As for Vegas, I find I like it for a couple of days, but only if I maintain a suitable low-level alcohol-induced buzz; not enough to act inappropriately, but enough to develop the type of viewpoint that allows me to rationalize being in the 5th level of hell in the first place. More than a couple of days, however, and I start to become irrationally uptight and twitchy. It’s probably a coping mechanism–I’m not a psychologist so I can’t be sure–but I just assume at that point I’ve stayed to long and need to leave. The 5th level of hell. Exactly that. I’ll dig into the resorts. Going on the off-season appeals to me. Fewer people to contend with can’t be a bad thing.